J.D. Power and Associates is best known as a market research company, mostly focused on quality and customer satisfaction. They have always seen the consumer as a key stakeholder of theirs. McGraw Hill Financial Co. now owns J.D. Power. Founder J. David Power was frustrated with how Auto Companies Senior Management was fed data that told them what they wanted to hear. The data was tortured to meet Senior Management’s expectations. Hence, the Edsel was born and rapidly died. Founded in the kitchen while sitting around the kitchen table, it was a family business right from the start. As a kid Jamey stuffed envelopes for surveys, and as he got older processed data. Early clients were Toyota, Carnation, US Borax, McCullough Chain Saws, and others. In 1968, an early customer was Toyota, who had spent 10 years failing miserably in the US Market. They found that they had quality issues, parts availability issues and a lot more issues. What made Toyota different was they had a thirst for data, and a strong desire to understand the market. What really changed things and made J.D. Power a household name was that in 1985, They did an Auto Industry Wide, customer satisfaction at one year of ownership survey and published the results. Competition was increasing and this was the first comparison industry wide, a truly impartial study comparing one manufacturer to another. The first go around Subaru was #2 overall and very proud of it, being only second to Mercedes-Benz, much to Mercedes chagrin. Subaru Ran Ads touting their J.D. Power quality rating and the Chairman of Mercedes-Benz was complaining to J.D. Power about the comparison to lowly Subaru…! J.D. Power realized the value of their rating system and wisely monetized it, by licensing the use of their name and logo to the winners. It steadily grew into an annual even highly anticipated by the auto manufacturers, subsidiaries and parts manufacturers. 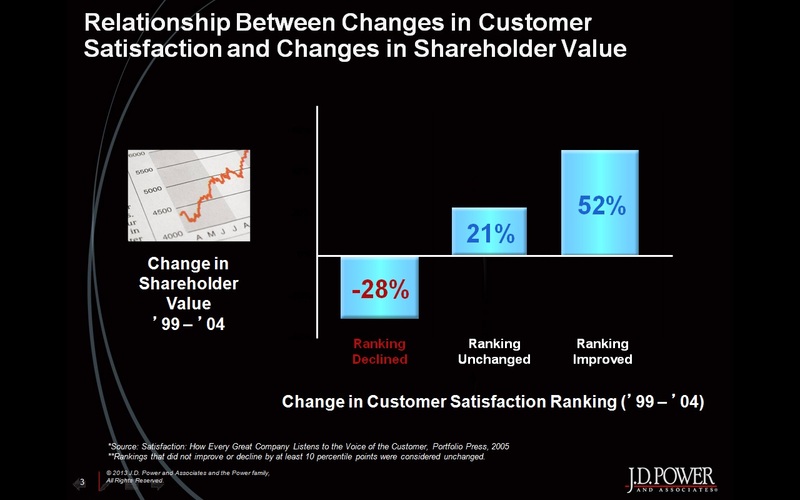 They did an analysis of change in stockholder value vs. customer satisfaction the results were startling. Consumer expectations continue to rise. In some cases, this drives companies to see consumer information as a strategic tool to gain an advantage over the competition. 1. Mike Diamond plumber differentiated his service with the smell good plumber, and white surgical booties worn by every plumber. Customer had viewed plumbers as dirty and smelly. 2. Ameristar Casinos tested two types of Black Jack Dealer personalities. One was aloof and professional they other was professional, outgoing and chatty. The more personable dealer increased revenue by 15%. Hyundai had huge quality problems, and was at 59% below the US standard. The new chairman decided to make quality #1 and set up a quality office in the HQ building on the 1st floor. He visited the quality office twice a day, every day. They took a War Room approach. They went from 90,000 units in 1998 to 455,000 units a year in 2005 here in the US. 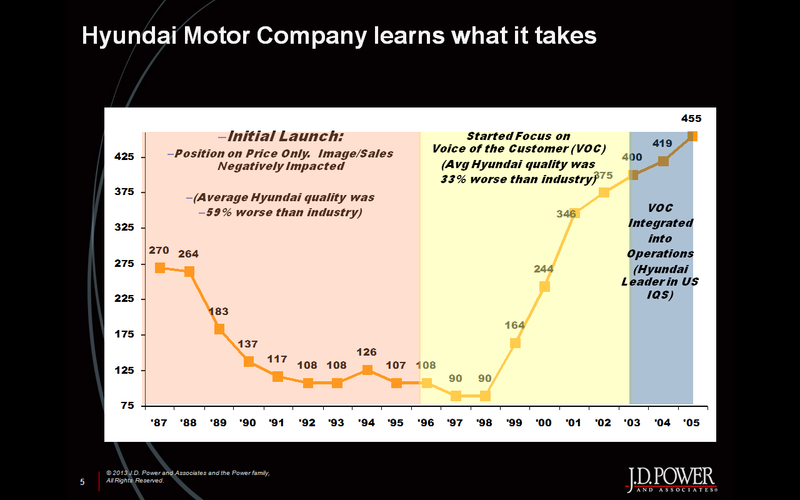 By focusing on the customer and quality Hyundai was able to turn around the situation in the US. It took attention from the very top of the organization to make it happen. 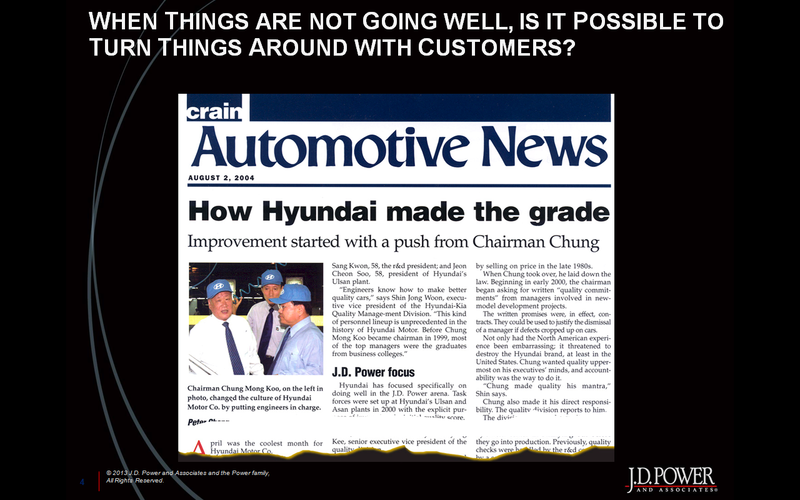 Chairman Chungs focus on the customer made it happen and established Hyundai’s strong position in the US Automotive Market. By using real unbiased customer perceptions from J.D. Power they got to know what worked and what didn’t. Without those key insights it is unlikely Hyundai would have been able to succeed in the US Automotive Market. Jamey Power is a former Senior Vice President and Strategic Advisor at J.D. Power and Associates. As the son of J.D. “Dave” Power III, founder of J.D. Power and Associates, Jamey literally grew up with the business. He, like the other children in the Power family, worked at the company in a variety of jobs throughout his early school years and into college. He joined the company as a professional employee in 1990. Most recently, he facilitated the transition from a private business to becoming part of The McGraw Hill Companies. From 1997 to 2009, he was Senior Vice President and General Manager—International Operations. During this period, the international business grew to represent about 20% of the company’s overall business, and offices were established throughout Asia, Europe and Canada to conduct studies in many countries throughout the world. For a period of time, when J.D. Power Asia Pacific was a wholly owned subsidiary of J.D. Power and Associates, Jamey served as its Chairman. In the mid 1990s, he moved to Michigan to manage the J.D. Power and Associates regional office in Troy, Michigan. Today, Jamey manages several of the Power family’s community and philanthropic activities, which focus on education and the National Multiple Sclerosis Society. This entry was posted in CA, CRM, Marketing, Orange County, Phil Sallaway, Product Manager Orange County, Salesforce CRM and tagged 714, 949, Automotive Quality, Hyundai, J.D. Power, Jamey Power, Marketing, Phil Sallaway, Phil Sallaway Product Manager Orange County California, Sales, Sales Leadership Alliance, Salesforce. Bookmark the permalink.